For the first 30 percent of this book I was ready to quit reading. The main characters were seriously flawed each in their own ways, unlikable. The point of view characters of Quin, Shinobu, John, none were characters I could feel connected with or cared about. Quin blindly followed her father although she hated the evil things he made her do. Shinobu turned to substances to survive the guilt of the same crimes. And John went even darker, jeopardizing the life of the girl he loved in pursuit of a long-dead promise. But stubborn me hung in there until character arc was full-filled, and I changed my opinion of Quin and Shinobu. From finding them weak, I found them determined. Arwen Elys Dayton did a great job of showing how a villain can justify anything to make their actions reasonable and acceptable in their own mind. Her handling of the central antagonist was masterful. Nice action and nice mix of fantasy. I would have like to be included in the scene where Quin first uses their "magic" instead of witnessing it as second-hand flashbacks, memories and dreams. 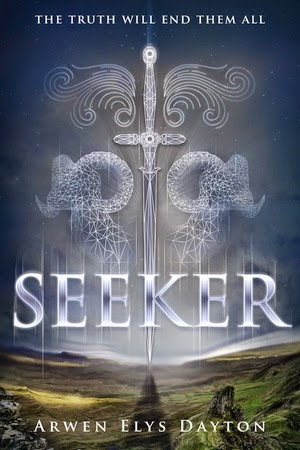 I believe the sequel will show us more about what a Seeker actually does.